The median PFS increased from 9.3 months with fulvestrant alone to 16.4 months when abemaciclib was added, a 45% reduced risk for disease progression or death favoring the combination therapy. A consistent advantage for the combination was observed across all of the prespecified subgroups. “Abemaciclib plus fulvestrant was an effective treatment for women with HR-positive, HER2-negative advanced breast cancer whose disease progressed on prior endocrine therapy. Abemaciclib dosed on a continuous schedule was generally well-tolerated,” said Dr Sledge. These results were also published in the Journal of Clinical Oncology to coincide with his talk. The double-blind, phase 3, MONARCH-2 clinical trial enrolled 669 women with HR-positive, HER2-negative advanced breast cancer resistant to hormone therapy. Women were recruited at 142 centers in 19 countries and were randomized in a 2:1 ratio to the combination of abemaciclib plus fulvestrant or fulvestrant plus placebo. The initial dose of abemaciclib was 200 mg twice daily, which was reduced to 150 mg twice daily because of reported diarrhea with the higher dose in the first 178 women. Fulvestrant was dosed at 500 mg twice daily. At a median follow-up of 19.5 months, the median PFS was 16.4 months with abemaciclib plus fulvestrant versus 9.3 months with fulvestrant plus placebo (P <.0001). The objective response rate was doubled with the addition of abemaciclib (48.1%) versus fulvestrant monotherapy (21.3%). “The response rate is, to the best of our knowledge, the highest recorded in an endocrine-resistant population,” said Dr Sledge. An intent-to-treat analysis showed that the average reduction in tumor size was doubled with the combination (35%) versus fulvestrant (16.1%; P <.001). The median duration of response was not yet reached in the combination arm versus 25.6 months in the fulvestrant arm. The combination was associated with a higher incidence of all-grade adverse events compared with fulvestrant plus placebo, including diarrhea (86.4% vs 24.7%, respectively) and neutropenia (46% vs 4%, respectively). Patients in the abemaciclib-containing arm also reported increased rates of abdominal pain, anemia, leukopenia, decreased appetite, and vomiting. The most common grade 3 or 4 adverse events with the combination treatment versus fulvestrant were neutropenia (26.5% vs 1.7%, respectively) and diarrhea (13.4% vs 0.4%). Diarrhea occurred early in the treatment course, predominantly during the first treatment cycle, and appeared to be related to the dose of abemaciclib. Once the abemaciclib dose was reduced, severe diarrhea was rare. Adverse events led to dose reduction in 42.9% of patients in the combination arm versus 1.3% in the fulvestrant plus placebo arm; the study drug was discontinued because of adverse events in 15.9% and in 3.1% of patients, respectively. 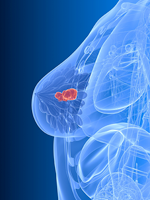 Based on these positive results in patients with advanced breast cancer, a phase 3 clinical trial of abemaciclib and endocrine therapy is planned for the adjuvant setting. Which CDK4/CDK6 Inhibitor to Use? Abemaciclib joins palbociclib (Ibrance) and ribociclib (Kisqali) as CDK4/CDK6 inhibitors that demonstrate a PFS advantage in patients with HR-positive, HER2-negative advanced breast cancer when combined with endocrine therapy. CDK4/CDK6 inhibitors will most likely not have a role as monotherapy, said Ingrid Mayer, MD, Associate Professor of Medicine, Division of Hematology/Oncology, Vanderbilt University Medical Center, Nashville, TN, who discussed the study results. Clinicians should select therapy based on 2 scenarios, using data from the MONARCH-2 clinical trial and from phase 3 studies of palbociclib and ribociclib, advised Dr Mayer. The first scenario is second-line treatment with a CDK4/CDK6 inhibitor plus fulvestrant in patients with a long disease-free interval (ie, approximately 15 months) after developing acquired resistance to first-line endocrine therapy. The second scenario involves patients with primary estrogen therapy resistance; for these patients she suggests combination therapy with a CDK4/CDK6 inhibitor plus an aromatase inhibitor as a first-line option, followed by fulvestrant as a second-line option. The hope is that longer-term follow-up will show an overall survival benefit, but that has not happened yet.